I’ve seen a lot of geeky shirts, but these ones take the cake. Or not. 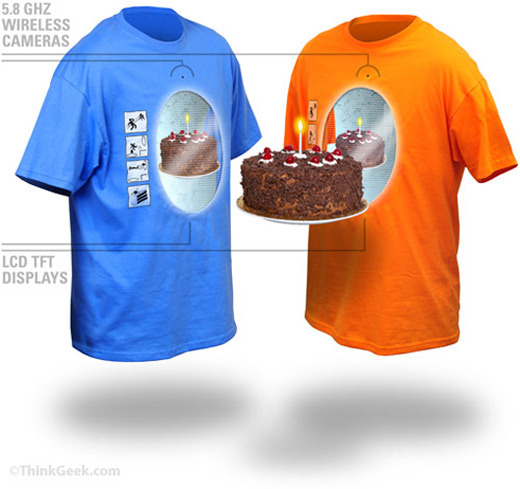 Think Geek‘s April Fools offering for this year are “interactive portal shirts”, that mimic the portal effect popularized by Valve’s first-person puzzler. Each $100 shirt has a wireless 5.6 GHz video camera and a portal-shaped LCD TFT screen. The camera on the blue shirt transmits its image to the screen on the orange shirt and vice-versa. 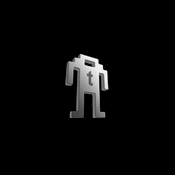 Mindfrak. Each shirt is powered by a 2190mAh Lithium-Ion battery pack, stored in a belt pack. Right. He already ate some of the cake and he still says it’s a lie? Okay I’m just pissed off because I haven’t played Portal yet. Stupid inside jokes.